Clay soil is one of the most difficult conditions a gardener can face. Dense and slippery when wet, it is even more of a challenge as it bakes brick solid when dry. Clay particles are extremely small and tend to pack together, leaving no room for air or water movement. Not every plant is going to be able to grow in clay, but plenty can, and some even help make clay soil better. The first order of business for any gardener with clay soil is to improve the texture of the soil with organic matter. Unfortunately, soil keeps trying to go back to its native state, so there is no one time fix. This will be an ongoing process, but the benefits will pay off in the long run. Generously amending or top dressing with compost, leaf mold, composted manure or other types of organic matter will gradually bulk up the texture of your soil, lessening the compaction. Choosing plants to grow in clay soil takes some discretion. Certainly, plants that need well-drained soil are not going to be happy growing in clay. But, do not give up. There are plants that not only tolerate clay soil, many will also help break up and improve its texture and therefore improve its drainage. Tap-rooted plants can get deep enough so that their roots do not rot and they break up the texture of clay on their way down. In addition to them, rugged native prairie plants have the constitution to hold up in clay. It can be a bit more effort to get plants established in clay soil than in loamy soil, not to mention the effort it takes just to dig a hole in clay. The good news is that clay tends to be much higher in nutrients than sandy soil. You will still need to meet other growing requirements, like sun exposure and U.S. Department of Agriculture hardiness zones, but the plants listed here are all capable of not just growing in clay soil, but also thriving. Adam's needle is actually a broadleaf evergreen, with sword-like leaves and a flower stalk that shoots out of the center of the plant and doubles the plant's height. It grows in zones 5 through 10. The delicate willow-like leaves of Arkansas Blue Star make it a lovely foliage plant in the border. Pale blue star-shaped flowers bloom in late spring followed by nice looking seed pods. The golden fall foliage color rounds out the season. It grows in zones 5 through 9. Asters are late flowering perennials that take your garden through to frost. There are several types of asters, but New England and New York are the two most commonly grown, especially the newer cultivars that do not spread as aggressively and remain more compact and rounded. It grows in zones 4 through 8. Big bluestem is a warm-season grass that loves arid growing conditions. It can be ornamental and is also popular for erosion control. It grows in zones 2 through 7. Black-eyed Susans are a staple in gardens because they are so adaptable and low maintenance. They will bloom for months and live for years. It grows in zones 3 through 7. 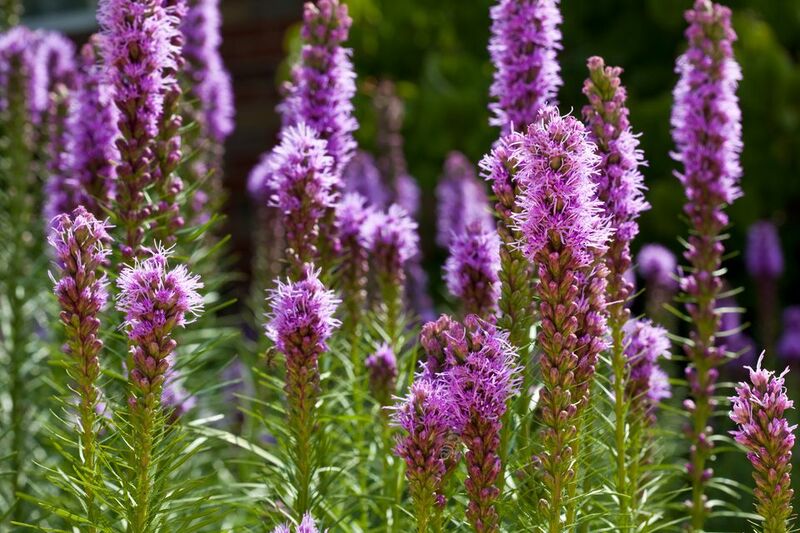 Liatris plants have grassy foliage and spiky bottle-brush flowers that bloom over a long period. This particular variety is very popular with monarch butterflies, who will spend hours feasting on the nectar. It grows in zones 4 through 9. This North American native perennial produces umbel-shaped flowers in brilliant orange, yellow, red, and combinations. It is very attractive to butterflies, as well as bees and hummingbirds. Its long taproot makes it very drought tolerant. It grows in zones 4 through 9. Canadian wild rye is a clump-forming, cool-season grass with a gentle arching habit. 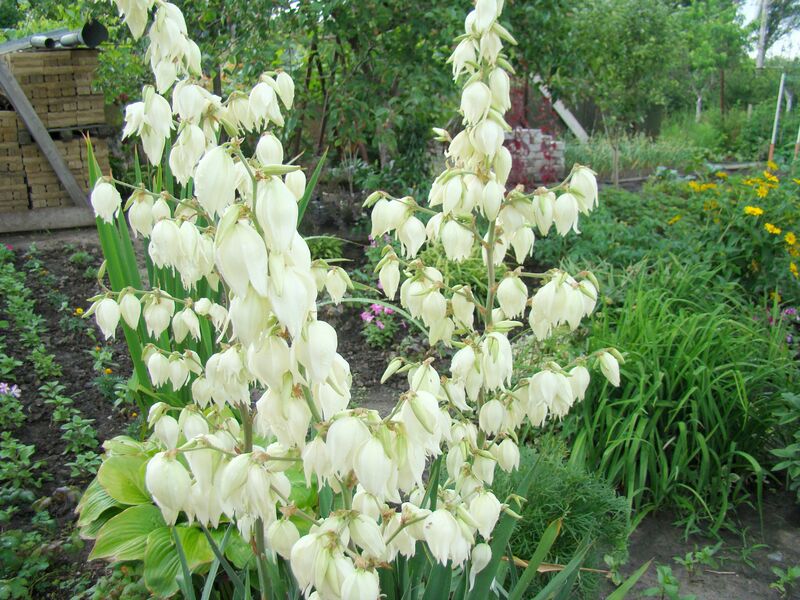 Although it is very ornamental, it is a better choice for naturalizing. It grows in zones 3 through 8. Silphium plants are distinctive prairie plants that like the rich quality of clay soils. They hold their sunny golden flowers high above the foliage of the plant. Besides the compass plant, the shorter Silphium integrifolium, prairie dock, also makes a good choice. It grows in zones 4 through 7. Coneflowers are tough, dependable prairie plants. The purple variety is the most well known, but newer hybrids come in a wide variety of colors, however, they tend to be sterile and cannot be grown from seed. It grows in zones 3 through 9. It is called the cup plant because water collects in the cups formed where the leaves meet the stems. This type of Silphium is extremely popular with birds. It grows in zones 5 through 9. Although each flower blooms for only one day, there are plenty of them. You would be hard-pressed to find a more dependable flower and new, larger varieties are being introduced every year. It grows in zones 3 through 10. Drooping coneflower does not have the refined look of Ratibida columnifera, the Mexican hat flower, but it is much hardier and more adaptable, with the same cheery swept-back petals. It grows in zones 3 through 10. Miscanthus varieties are some of the most popular ornamental grasses to grow. They are warm-season grasses, blooming late in the season. They are clump formers but self-seeding may become a nuisance. It grows in zones 4 through 9. Fountain grasses are beloved for their fluffy, feathery panicles. You will find fountain grasses in a wide range of heights and colors, but they tend to only be perennial in warmer zones. It grows in zones 6 through 9. Goldenrod gets a bad rap because people confuse it with the allergy-producing ragweed. Goldenrod does not aggravate the sinuses and the newer varieties are very well-behaved in the garden. It grows in zones 5 through 9. Indian grass starts the season as a low-growing clump. By mid-summer, they begin to send up their tall flower stalks and remain attractive through winter. It grows in zones 5 through 8. New York ironweed is a vigorous wildflower that puts out clusters of small violet flowers atop a 5- to 7-foot plant. It prefers damp growing conditions. It grows in zones 5 through 9. This plant can handle all kinds of tough conditions, even wet clay. It has the Liatris habit of starting to bloom at the top of its bottle-brush flower and slowly works its way down. It grows in zones 4 through 9. Its thistle-like flower heads make sea holly an unusual sight in the flower garden. The flowers can be steely blue or almost gray. These plants love dry heat. It grows in zones 5 through 10. Tall sedums are mainstays of the late summer garden. There have been many new introductions, but none have overtaken "Autumn Joy" in popularity because it is so reliable and easy to grow. It grows in zones 3 through 10. Although perennial sunflowers are not as large and showy as the annual sunflower, perennial Helianthus make a brilliant display in the garden. Three nice species to grow are swamp sunflower (Helianthus angustifolius), which grows in zones 6 through 9; false sunflower (Helianthus x laetiflorus), which grows in zones 5 through 9; and ox eye (Heliopsis helianthoides), which grows in zones 4 through 9. Grassy-leaved sweet flag is a short, ornamental grass that can grow in damp areas or even submerged in water. It will spread by rhizomes but usually is not invasive. It grows in zones 10 and 11. Switch grasses are tall, upright, clump-forming grasses with airy, almost feathery flowers that appear late in the season. Except for cutting back and dividing, these grasses take care of themselves. It grows in zones 5 through 9. Coreopsis are extremely hardy North American native plants. They are drought resistant, low maintenance, and repeat blooming. The narrow, thread-leaf varieties have become very popular. It grows in zones 4 through 8. Wild bee balm does not care what kind of soil it grows in, but it does like things on the dry side. It has familiar flower heads that spread out like sparklers. Pinching them back early in the season will make for bushier plants. It grows in zones 3 through 9. Clay soil can be a challenge for your garden, but if you can get plants established there, usually those plants can take care of themselves. Choose plants that do well in your growing conditions and half the battle is won.